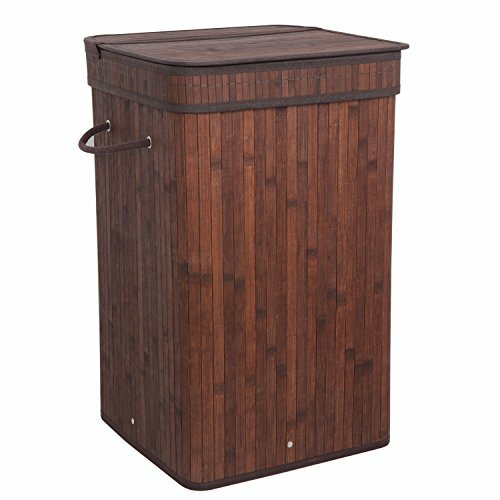 ZENY Round/Square Laundry Hamper with Lid and Cloth Liner is a great addition to any bedroom, laundry room or bathroom. The hamper features a lid keeping dirty clothes out of site while also concealing any smells. The cloth liner is washable, making it great for many uses (cold water, gentle cycle: air dry or low tumble dry). Constructed from natural bamboo, the hamper offers you a durable yet lightweight solution to organizing your dirty clothes. The hamper can fit 1 standard sized loads of laundry. Our laundry hamper will help you keep your home organized without being a big eye sore. It helps keep dirty clothes off the floor by offering a single location for your dirty clothes. DURABLE and LIGHTWEIGHT - The laundry hamper has been designed from natural bamboo material to be lightweight yet durable for frequent use in your bedroom, laundry room or bathroom. SPACIOUS INTERIOR - The single laundry hamper can hold up to 1 load of dirty clothes.